Do you want work on a cruise ship? Ship life - what’s it all about? How many shows do you need? What kind of accommodation do they offer? For Singers, Magicians, Comedians, Ventriloquists, Jugglers, Classical Acts, Multi-Instrumentalists, Musicians, Lecturers, Speakers, Dancers, etc. 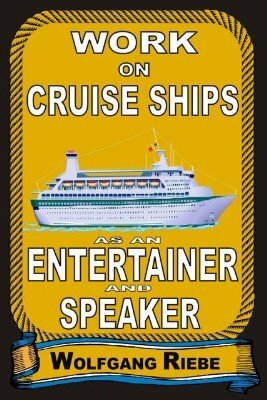 Everything you ever need to know about cruise liners. Inform yourself of all the ins and outs of this industry. Make the right choices. Plus ‘contact addresses’ of cruise companies and agents. Chapters include: First things First! Ship Life, Ship Terminology, or Speaking Nautically, The Cruise Director, Types of Contracts, Entertainer/Cruise Staff Contract, Musician Contract, Singer and Musical Speciality Act, Guest Entertainer Contract, Speakers & Lecturers, Contract Duration, Cancellation Clause, Details of Work, Transport, Customs Clause, Medical Costs & Equipment Cover, Arrival and Departure Dates, Passports and Visas, Accommodation, Bar Accounts, Eating and Dining Rooms, Tipping	, Salaries, Comment Cards, Stages - Various Sizes, Storage Space, Illusions/Props, Tools - Accessories, Dress, Laundry Facilities, Costumes, Who do I need to make friends with on board? Mixing with Passengers, Socialising with the Crew, Facilities on Board, Sea Sickness, Hospital & Mortuary, Communicating with Home, Planning your Day, Selling Your Products, Making Even More Money, Anecdotes & Experiences on Board, Ship Related Jokes, Contacts: Agent Addresses, Contacts: Cruise Line Addresses. 1st edition 1991; revised 2008; 157 pages.